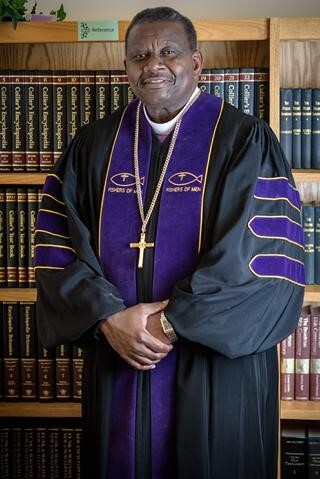 A native of Charleston, South Carolina, Bishop Hazel preached his initial Sermon July 11, 1993 and was ordained by the Washington and Norfolk District Assembly, October 2014. Bishop Hazel has served as pastor for New Bethel Church of Christ, Disciples of Christ and Holly Grove Church of Christ, Disciples of Christ for more than 20 years. At Mt. Olive Church of Christ, Disciples of Christ in Portsmouth, Va, Bishop Hazel served as deacon, treasurer and trustee under the leadership of Elder John E. Bryant. He was District Elder of the South Albemarle District Union for eight years, served as the Chairman of the Council Board and member of the Ordination Board of the Washington Norfolk District Assembly. His educational background includes an Associate Degree from Tidewater Community College and a Bachelor of Science Degree from Norfolk State University. Bishop Hazel received his Masters of Divinity and Doctorate of Ministry from Norfolk Theological Seminary & College. He is married to Dr. Jennifer Hazel and they currently reside in Chesapeake, VA. They have blessed with three children and five grandchildren.